Okay, not exactly bombproof, but these plants are STURDY. Mine have withstood extreme adversity over the years; crammed into a 1988 Jetta while moving house, falling from windowsills, shelves and tables, being ‘claimed’ by my male feline, forgotten outside during a snowstorm and inside during a month long holiday, dutifully surviving life beside the fireplace. They are often referred to when someone is attempting to drive home the point that they are terrible at caring for plants - '“No really, I am awful. I’ve even killed a Snake Plant!” and are found thriving in the darkest corners of restaurants, cafes and homes. Snake Plants, (Sansevieria) also called Mother In Law-in-Law’s Tongue due to the sharp spear-like shape of their leaves (capable of whispering criticisms and passive aggressive assaults), are grouped within the taxonomic family Asparagaceae (yes, that’s asparagus). They are native to Africa, Madagascar and Southern Asia where their leaves were stripped down to produce a strong fibrous material that was used to make rope, baskets, bowstrings and bandages. They have spread successfully to Mexico, Southern United States, the warmer climates of Europe, the houses of many and even to space! According to NASA, Snake Plants are one of the most effective air purifiers, surpassed only by the Peace Lily. NASA has claimed it as on of their favourite houseplants (spaceplants? ), which is a lofty title to hold, because who knows more about oxygen and air than those who attempt to produce, purify, and maintain it 400 kilometers above sea level? Through their research, NASA uncovered that Snake Plants are wizards at removing formaldehyde, xylene, toluene, and nitrogen oxides from our atmosphere and when we are sleeping, remove carbon dioxide from the air to produce oxygen. 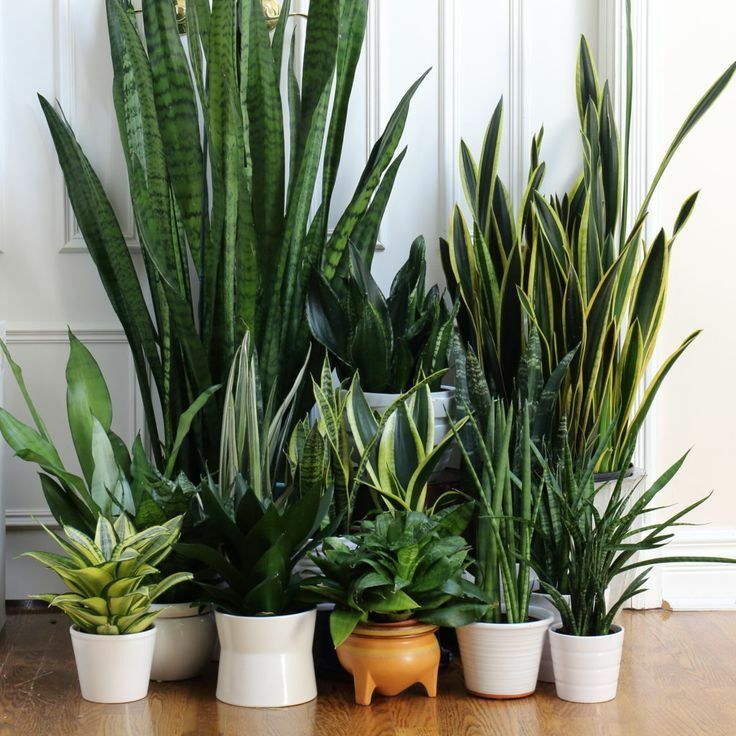 They claim that 6-8 of these plants per person are needed to survive if there is no air flow, meaning that you and your Snake Plant family could survive in a completely air-tight room! The Snake Plant’s air purification process is also effective at alleviating symptoms of sick building syndrome, a legit problem for apartment dwellers and office workers alike. SBS describes the acute health or comfort related symptoms that occupants of a building experience when that building has poor ventilation. Symptoms include headaches, itchiness, coughing, asthmatic attacks and fatigue and are often relieved once they have left that environment. A couple of Snake Plants in a stuffy room can go a long way. Sansevieria’s structured upright habit lends it a sense of sophistication and modernism. I have used it in countless designs and rarely fail to recommend it to clients. It looks stunning in a mid-century modern planter in the hallway, planted with other succulents in a bowl on the patio, or in a chunky eclectic pot amongst other foliage. Over the years, breeders have concocted vast variations in variegation and shape, from the common yellow-green striped Sansevieria trifasciata 'Black Jack', the short table-worthy Sansevieria trifasciata 'Futura Robusta', the conical unicorn-like Sansevieria trifasciata 'Cylindrica', to the the wide whale fin-like Sansevieria masoniana. There is literally one for everyone. 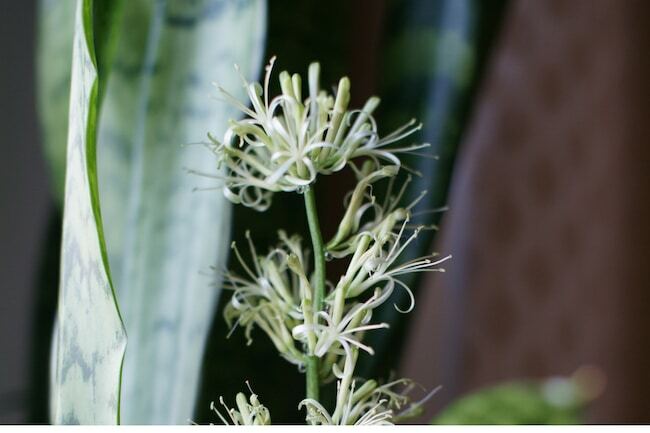 Every plant flowers in one way or another, including Snake Plants. These small, fragrant blossoms are a a good indicator that your plant is stressed and would like to be repotted. I like to think that, should humans cease to exist due to some most likely self-induced catastrophic event, the resiliency and some 460 million years experience on us will allow some plant life to remain. Of these plants, Sansevieria will definitely be one. With the right watering techniques, your Snake Plant will grow pretty much anywhere. Light - Indoors, these guys can take it all - full, indirect, zero. It is the only plant that I have recommended and seen survive artificial-only light. Outdoors, they can grow in shade to sun, however I have seen them burn slightly in the hot afternoon sun in warmer climates. Water - Overwatering is the #1 killer. Snake Plants are succulents - they store water in their leaves and rhizomes. If they are overwatered and left to stand in moist soil, they will begin to rot. Let the soil dry out completely before watering deeply. Ensure that when you water, you are giving enough water to soak all the way down to the rhizomes, not just the fine shallow roots. In the summer you may need to water weekly, in the winter you may need hold off for a month at a time. Soil - Use or make a soil with lots of larger particles, such as sand, perlite, pumice, small stones and bark, to encourage water to drain through the soil. If your container does not have a hole, use your finger to test the soil as deep down as possible before watering. Placement - Pretty much anywhere! To avoid uneven growth, rotate every few months. Repotting & Propagating - Repot when it looks like your Snake Plant is about to burst out of its container. You can choose to either plant in a larger container or divide up into a few smaller plants. To divide a snake plant simply snip off chunks of rhizomes with a pair of clean sharp secuteres and pack enough soil around to avoid the leaves from splaying. Another method of propagating is to cut a leave into chunks, let them callous over for 24 hours and sticking them into sterile potting soil. Keep track of tops and bottoms, they won’t take if they’re planted upside down. SO! New to plant parenthood? Try and Snake Plant. Have a dark corner in your home? Try and Snake Plant. Have a hole to fill in the planter? Try and Snake Plant. Need a gift? Try a Snake Plant. Frustrated with growing pretty much anything? Try a Snake Plant! Have questions? Ask me!